Can’t get enough of ’em news reports to trade? 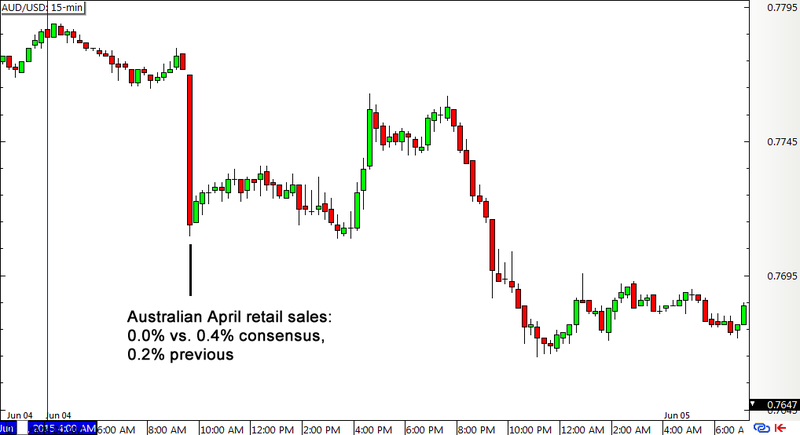 Here’s another top-tier economic release coming your way in the form of Australia’s retail sales report for May! Hey, that rhymes! This report is up for release in tomorrow’s Asian trading session and usually generates a strong forex reaction among Aussie pairs then. If you’re looking to grab quick pips off this event, let’s go through our usual Forex Trading Guide routine, shall we? The Australian retail sales report is basically a measure of whether our mates from the Land Down Under are spending or not. Every surfboard, bottle of sunblock, and boomerang that is purchased will be tallied under retail sales. With that, it gives a picture of how the consumer sector is faring and if they made a positive contribution to overall economic growth. In Australia, consumer spending accounts for roughly 50% of the country’s GDP. Apart from that, an increase in local consumption tends to encourage businesses to step up their production to meet rising demand, eventually translating to a pickup in hiring. Better employment conditions are good for consumer confidence, which then keeps spending and growth supported. Unfortunately for the Land Down Under, the past couple of retail sales figures didn’t turn out so well. The report printed a measly 0.2% uptick versus the projected 0.4% gain in March, followed by a flat reading in April. AUD/USD sold off sharply upon the release of weaker-than-expected results for April, as analysts were expecting to see a 0.4% rise then. On a more upbeat note, consumer spending was still up 4.4% in April compared to the same month a year ago. Components of the report indicated that clothing and footwear sales increased by 1.3% on a monthly basis while online purchases picked up by 3%, which suggests that Australians didn’t really hold back on their shopping sprees then. However, department store sales logged in a 0.7% decline while purchases in the “other retailing” category showed a 1.0% drop. Forex market analysts are expecting to see a 0.5% increase in retail sales for May, which might suggest that the standstill during the previous month was just a temporary setback. Take note, though, that employment data was significantly weaker than expected in May so Australians probably decided to take it easy with their purchases back then. Consumer confidence remained pretty strong in May, as indicated by the 6.4% jump in the Westpac consumer sentiment index for that month. Aside from that, the start of the winter season in the country (Yep, this is Australia we’re talking about!) probably boosted sales of boots, leather jackets, gloves, and hot cocoa. Since strong retail sales figures support economic growth prospects, a higher-than-expected read could spur Aussie appreciation. In contrast, weaker-than-expected consumer spending data could lead to weaker economic performance and currency depreciation. As you’ve probably noticed in the forex chart I posted above, AUD/USD typically has a strong initial reaction to the headline figures during the actual release. However, this move is barely sustained in the next few hours, as profit-taking usually takes place right around the end of the Asian trading session. This pattern has been going on for most of the previous releases also, even for reports with stronger-than-expected results. What’s your game plan for this release? Don’t be shy to share your thoughts in our comments section or to cast your votes in our poll below!